ISO 100 de Dymatize is the whey protein of ultra-rapid absorption, one of the purest of the market. Supports muscle building, protects the muscles, helps recover quickly. With a new delicious flavour, 100% hydrolyzate of whey protein isolate, one of the purest forms of protein. With seal Sport Trusted Choice, completely healthy and free of banned substances. 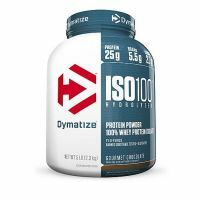 ISO 100 Dymatize is the whey protein of ultra-rapid absorption, one of the purest of the market. Supports muscle building, protects the muscles, helps recover quickly. With a new delicious flavour, 100% hydrolyzate of whey protein isolate, one of the purest forms of protein. With seal Sport Trusted Choice, completely healthy and free of banned substances. Designed for athletes training intensely. It helps achieve the objectives faster and build muscle mass intelligently, with an optimal combination of nutrition and hard work in the gym. Provides 25 grams of hydrolyzate made up of 100% whey protein isolate , 5.5 grams of BCAAs including L-leucine, no gluten, no lactose and less than 1 gram of sugar and fat per serving. ISO 100 Dymatize is formulated to have an ultra-rapid absorption, the necessary to stop catabolism in the morning and speed recovery after training. It is designed for athletes who train intensively, offering everything your body needs to maintain muscle mass and build muscle more effectively. As the ISO-100 standard consists of 100% hydrolyzate of whey protein isolate, you can ensure optimal nutrients without fillers, which are commonly used in these products. The hydrolyzate of whey protein isolate is one of the most effective proteins, and one of the most advanced formulas that can be found currently. The protein is hydrolyzed to obtain a more efficient use of the organism and helps digest proteins because of its smaller structure. It allows for a quick replacement of amino acids, ideal for protein levels in the morning to return to a normal range, which keeps muscles in top condition. ISO 100 Dymatize is a product of high quality and purity, of whey protein obtained by in cold crossflow microfiltration, filtered in order to preserve all important active ingredients such as lactoferrin and immunoglobulins, which are lost when processed in other ways. This product is manufactured in plants of the company Dymatize, with GMP quality assurance of good manufacturing practices, and guaranteed with the seal Choice Trusted Sport free of banned substances. I love the taste, one of the best I had. It dissolves allright, in spite of a little foam that forms in the inicial shake, but then it settles. The best Protein i ever tried , nice flavour , easy mix..good results.!! Very easy to mix / blend and the shake tastes very good as well. Do you want your free supplements? Do you advises your friends in the gym? You have a tasty Fit recipe? 1. Make a video. It can be recipes, a tutorial on how to take or combine a product or unboxing (experience and opinions) of one of your MASmusculo orders. 2. Upload your video to MASmusculo using our app. 3. Share the video with your friends: Facebook, Twitter, Telegram, Snapchat . If you've found the lowest price please fill this form in and we will beat it or otherwise match. Specific offers or settlements not included. Web address of the company where you found this product cheaper. Please specify the product full URL.